That’s why now, passengers will be able to change their drop-off point within their own Grab app with the new Passenger Change Drop-off feature. 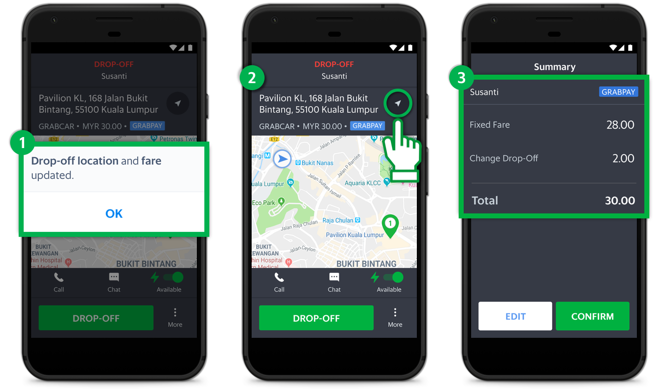 When this happens, your Grab Driver app will update automatically* to show the new destination, the fixed fare for the total distance travelled, as well as a ‘Change Drop-Off’ surcharge of RM2. Passengers can only change their drop-off point once, and this will only be applicable to fixed fare rides. The ‘Change Drop-Off’ surcharge is included in the fare, please DO NOT collect from passengers. For driver-partners on third-party navigation apps (Google Maps, Waze, etc. ), you will receive a pop-up (Android) or push notification (iOS) alert when the destination changes. Please tap on the Navigate button again to route to the correct drop-off point. For your safety, please only accept requests to change destinations from the app. For all service types except GrabTaxi. How does Grab calculate the fare when a passenger changes his/her destination? The fare will be based on (1) the distance already travelled, (2) the distance to the new drop-off point, (3) any high-demand pricing present at time of original booking, and (4) will include a ‘Change Drop-Off’ surcharge. How many times can a passenger change his/her destination? Passenger can only change their destination once per trip. For GrabShare rides and My Destination jobs, can passengers change their destination? No, passengers will not be able to change their destination for GrabShare rides and My Destination jobs. Can the passenger change his/her drop-off point after I’ve accepted a Back-to-Back (B2B) job? No, passengers will not be able to change their destination after you’ve accepted a back-to-back (B2B) job. If I’m on a third-party navigation app (e.g. Google Maps, Waze), will I be notified if the passenger changes his/her destination? Yes. Android users will receive a pop-up alert, while iOS users will receive a push notification. Tap on the message to return to the Grab Driver app, and then tap on the Navigate button to route to the correct drop-off point. Does Grab collect commision from the ‘Change Drop-Off’ surcharge? Yes. Since the ‘Change Drop-Off’ surcharge is part of the fare, Grab will collect a commission from this.